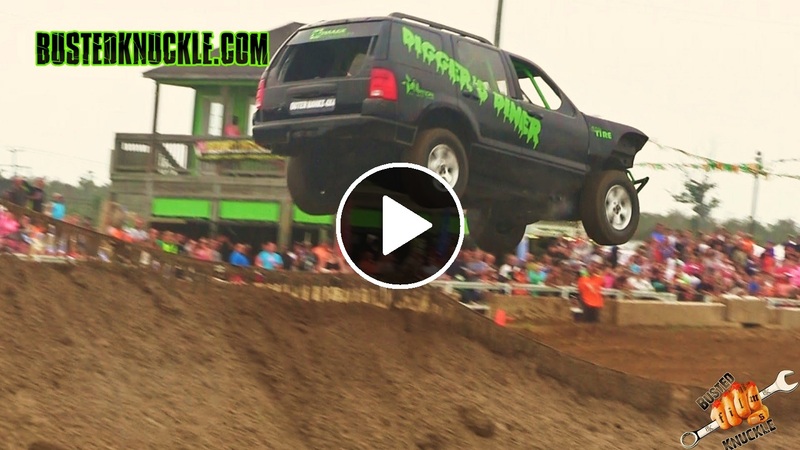 JEEP Grand Cherokee Jump goes Huge and Crashes Hard! One of my favorite events every year is North vs. South. It is a massive Mega Mud Truck event that takes place at Dennis Anderson’s park. You might recognize that name because he is the World famous driver of the Grave Digger monster truck. He also own’s a Muddy Motorsports Park. You might think I love this event for the Mega Trucks. The real reason I like to go is for the Tough Trucks. What is a Tough Truck? A Tough Truck is basically any four wheel drive vehicle that you are crazy enough to get behind the wheel of and destroy. They range from Jeep Cherokees and pick up trucks to a Suzuki Samurai. They break out the glass, weld in a cage, and get ready to air them out. The crazy thing is they run an obstacle course made for mega trucks with these mostly stock vehicles. Some of the jumps are down right insane. Until Next time be sure to head over to the Busted Knuckle Youtube Channel and become a subscriber. It’s Free and keeps you up to date with out latest videos. We publish a new video every day of the week. If you thought this Jeep Grand Cherokee Jump was awesome be sure to check out the compilation video of the event below for more.